The reason I want to talk about top coats and not base coats is because I only really use one. I do have two different ones so I will quickly mention the base coats I use before moving on to the top coats. As mentioned in this post I now only use Tip Top Miraculous Results as a base coat. I got the Tip Top Protein Base before I got the miraculous results. It’s an absolutely fine base coat but I do prefer the miraculous results. If I ran out of it though I would continue to use the protein base. I also use the protein base when I am testing new polishes and know that it won’t be on my nails for long. So that is that as far as base coats. I love love love miraculous results and what it does for my nails. What do I look for in a top coat? My needs are simple. I love a quick drying top coat. It must leave my nails nice and shiny. It must not drag the polish. That’s about it. This top coat is really nice. It definitely is a quick drying top coat and it has a beautiful shine to it. 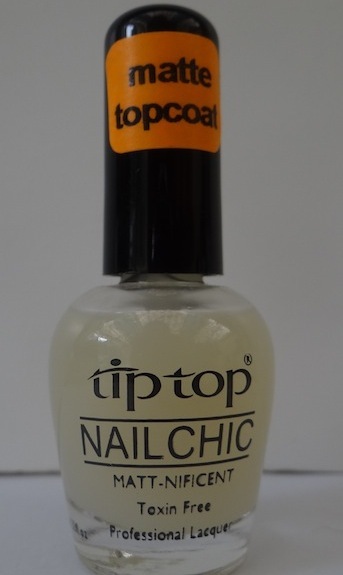 I think that it works best when used over Tip Top nail polish but it definitely works well over any nail polish. Because this one is slightly more expensive than some of the others I tend to only use this one when I use Tip Top polish. Might not make much sense but it just seems to happen that way. Actually, If I could I would use the brand of top coat that was the same as the brand of polish I was using. My OCD tendencies I suppose 😉 This is a favourite for sure. This does exactly what the name suggests. It will give any polish a matte finish. I love matte finishes. Of course this does not give you tons of shine – else it wouldn’t be matte – but it does dry quite quickly. I have also not experienced any dragging at all. I love this top coat. It really is one of my favourites and I will most likely be using this much more in future. 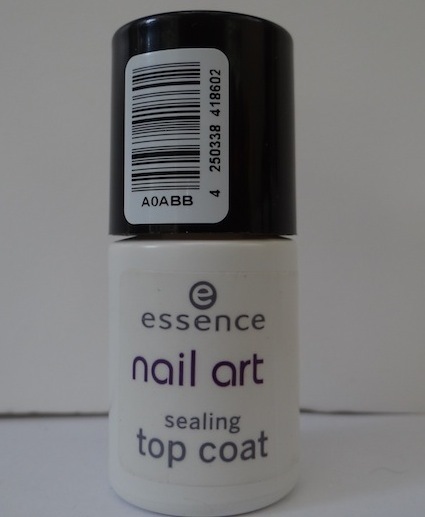 Essence Nail Art Sealing Top Coat. This top coat is fabulous. Especially if you have done lumpy / bumpy nail art. This really smooths out any raised surfaces. Dries fairly quick as well. This also leaves a beautiful shine. In all the time that I have used this I have only once had it drag some polish on one nail. I don’t know if I was in too much of a hurry or if this top coat is inclined to drag. Like I said, it only happened once. This is also quite thin so if you want a super squishy top coat you might want to add two coats or one thick coat. I prefer that it is thin though. I often have quite a few layers of polish on already so the thinner the better. Just a note. Essence has discontinued this product but there are still quite a few bottles of this left on our shelves. If you like this then go and grab them before they are sold out. I’ve already got my extra bottles. I only recently got this bottle of perfectness. I love this top coat. It really is a quick drying top coat. The first time I used it I had 7 coats (yes 7, incl base coat) of polish on my nails and then I added this top coat. 35 Minutes later I was scrubbing my nails with a nail scrubbing brush. Polishes usually take quite a while to dry all the way through and even though it will be dry to the touch and you can continue with your usual activities, the minute you really press or dig into it will still ding your polish. This was dry dry dry within 35 mins. I actually took a chance when I scrubbed it. I just HAD to scrub my nails and couldn’t wait anymore. I figured if it smudged it smudged and then that will be ok too. (My OCD tendencies again). I was shocked and surprised that no damage was done at all. I am sure I could’ve scrubbed even sooner than the 35 mins. I totally love love love this top coat. It is also on the thin side like the other Essence top coat so same thing applies. You can put two coats or one very thick coat but I do prefer the thinner consistency. I haven’t tried it yet over lumpy / bumpy nail art so not sure if it will also ‘flatten’ it like the other Essence top coat but once I have tried it I will definitely update here. 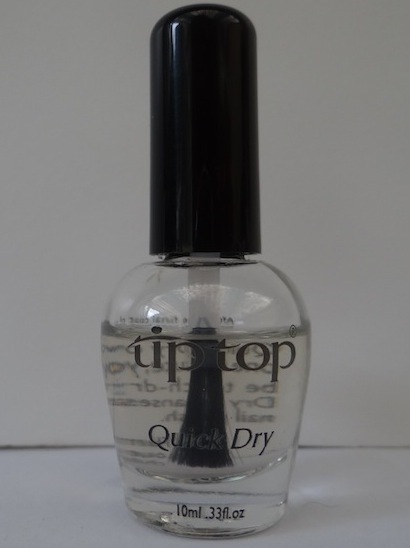 This truly is a quick drying top coat. I have not experienced any dragging with this top coat either. I must say though. All of these top coats are really good. I will definitely always have these in my supply. I would also still like to try some other brands of top coats. Like I sad before if I could have a top coat for every brand of polish it would be awesome. It’s not necessary but I would like to try that. Until then though these are definitely my usual favourites. Do you have a top coat you can recommend? I would love some good recommendations of shiny, quick drying top coats. Of course, I would love to try the oh so popular Seche Vite but it seems that in South Africa it just isn’t going to happen right now. If you do know of somewhere in SA I can get a hold of this please let me know too. ← Do you shop Cruelty Free? 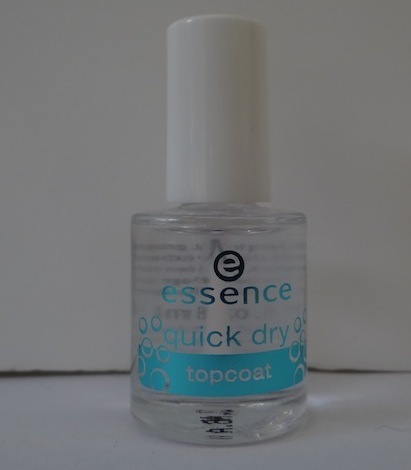 Essence also has a nice gel effect top coat which I love, it really keeps the polish from chipping for a long time. Dries relatively quickly as well. I think I’d try the Essence quick dry one as well, maybe next time. It didn’t dry quick enough for me and it is quite thick. I prefer the thinner ones but the shine is lovely. I am so in love with the Essence quick dry one. It has really amazed me. The matte top coat does retail for R40 but damn if it was on sale here, I’d so be there!! I saw on their FB page that it has been discontinued 🙁 I am definitely picking up another bottle as back up! Thank you 🙂 Something I didn’t here is the essence express dry drops. Excellent and really works. Worth it in my opinion! Whaaaaat!?!?! That is crazy! Why would they stop stocking it? Obviously this post is very old. I should probably do a new updated one. I have used the Sally Hansen Insta-dry (red bottle) and is closest to seche vite as far as speed dry is concerned. I did at the time have an issue with bubbles but on the second bottle it wasn’t an issue. I am not really a fan of Sally Hansen but the topcoat wasn’t bad at all. Otherwise, I buy my seche online on eBay (if the deal if good) or a local salon. I found them by checking out chinaglaze.co.za and found a salon close by that stocks china glaze. I have found most of them to stock Seche as well.